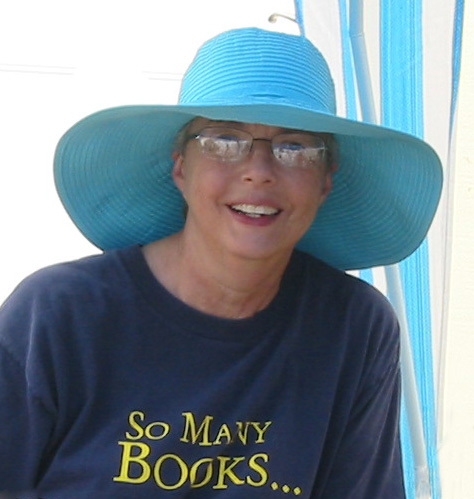 In July 2008, Hal and I were back at Okoboji for our annual reading marathon. I didn’t want to impose on the Carmichaels, but one day while on my walk I finally went to their house and knocked on their door. They invited me inside and showed me Mother’s painting, Ear of Iowa Corn (1949). They also showed me two paintings by Cathrine Barr. I was excited to see all three paintings and asked if I could get my camera and come back to take photos. They seemed glad to let me do this. This blue hat makes appearances with Clara during many walks at Lake Okoboji, as well as in this photo taken July 23, 2007, the day RAGBRAI went through Rolfe, Iowa. When I returned, Bill and Judy again welcomed me to their home and collaborated on taking pictures, especially since I had to photograph the paintings through glass and wanted to reduce glare from the flash. Bill and Judy even took down the paintings and posed with them. They were so gracious. When they took down Ear of Iowa Corn, I discovered an old newspaper clipping attached to the wire. The article, “A Busy Mother Heads Art Week,” told of Mother’s efforts in planning special activities to mark American Art Week in Iowa. A couple of statements in the text led me to believe the article was printed in late October 1951. An Internet search on the author, Herb Owens, revealed he wrote for the Des Moines Tribune. The Des Moines Register library staff confirmed the article was published on October 31, 1951. What a find! Indeed, it is a small world, and one thing always leads to another. If it weren’t for my blue hat, I might never have known about Ear of Iowa Corn and the Des Moines Tribune article. And I would not have met Betty, Bob, Bill and Judy, each of whom I’ll be able to greet when I walk in Maywood this summer. * For more information about prints of Mother’s (Marion Gunderson) watercolors, click here. 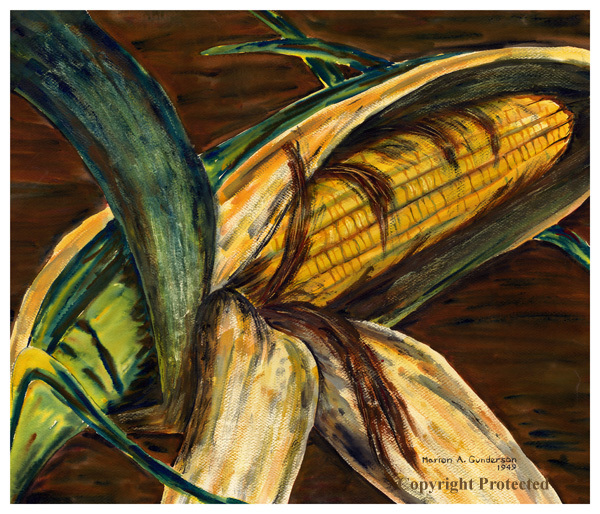 This entry was posted on July 10, 2009 at 9:30 am and is filed under Ear of Iowa Corn, Iowa, Marion Gunderson, Okoboji, Watercolor image. You can follow any responses to this entry through the RSS 2.0 feed. You can skip to the end and leave a response. Pinging is currently not allowed. Love the whole “small-world” series of discoveries! Thanks for sharing, Louise! I love everything about this article, Clara. (Is that the hat from the Lauritsen Gardens?) Gotta get me one of her prints!!! Yes! It is the very hat I bought when I was with you. I wear it frequently when I’m walking on sunny days.